Tired and lethargic tonight, and so have spent most of the evening horizontal, while listening to a CD that took me a little by surprise when I heard it for the first time a few days back and sounds just the kind of music I need on an evening like this as it plays right now. the disc in question is a new release on Creative Sources by the French duo of Jean-Sebastien Mariage (guitar) and David Chiesa (double bass) named Oort. 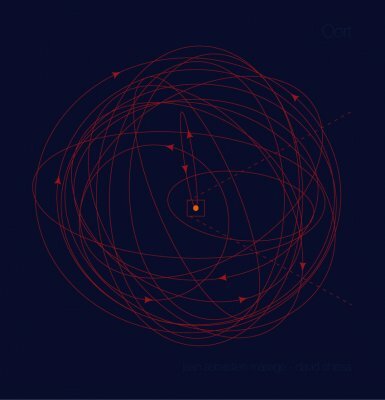 The Oort cloud is apparently the name given to a particular cluster of comets, and so the four tracks here are each named after a particular comet themselves. I have enjoyed the music made by both of these musicians before, but have somehow not really focussed on their individual work as each has been part of bigger groups I have listened to, with Mariage notably the guitarist in Hubbub. The four tracks here though, and in particular the opening thirteen minute Kirch’s Comet are really very beautiful indeed. Mariage plays either electric guitar or a very clear and warm, closely miked acoustic, and Chiesa just plays bass with no treatments or trickery. The music they make though is very slow, and on the opening piece very sparse, little clusters of softly chiming guitar notes, bass thuds and short scurrying sounds from one or the other. The sensation is of stars on a clear the night sky, some bright and glowing, others distantly murky, but all carefully placed with a seemingly deliberate sense of arrangement to them. This piece, like all four are completely improvised, but there is a very nice sense of composed delicacy and restraint here. I am reminded of Sugimoto from a decade ago, perhaps his duos with Annette Krebs because of the sense of space and the juxtaposition of light and heavy sounds, but certainly that feel of stripped down, simplified blues mixing with other more abstract musical styles. Oort is a very simple album, a set of recordings of two musicians listening to each other very carefully and then presenting understated, unadorned sounds that combine together to make the more complicated, but deceptively simple compositions presented here. The next three tracks use less silence- the slowness, the feeling of careful placement remains but the gaps between sounds reduce and the music flows easier as Chiesa adds bowed sounds to the fray and Mariage occasionally moves from the achingly beautiful plucked chimes to more percussively blunt struck sounds, but even at the music’s most active it is anything but busy. It all feels very fragile, and I am reminded of a Calder sculpture, simple shapes revolving very slowly, their relationship to each other changing slightly, shadows cast across one another but somehow remaining spaced apart, working with one another yet maintaining a distance. This CD really grabbed me as a very assured, considered work. I have no idea how much the duo have played together before but they sound perfectly in tune with one another, neither rocking the boat and yet both shaping and directing the music, the musical discussions vibrant and fluent, yet somehow never argumentative or aggressive. This is a CD likely to escape under the radar, but I encourage anyone with a taste for quiet, contemplative acoustic improvisation to give Oort a listen. With the lights down low and with a glass of something to hand on a quiet rainy night like this one it hits the spot for me perfectly. When I heard this record without checking anything related to the release, neither title and references nor musician’s biography, one of the first thing I thought the players could have developed an addiction from Ballance, a videogame issued by Atari, belonging to that kind of games causing anxiety especially if you try to play it when you’re drunk or differently gone. It’s quite easy to imagine it : you just control a ball you have to lead till some checking points placed along difficult pathways hanging over the clouds, possibly avoiding the ball’s falling in the void, but the music which keep company with the gamer over the thirteen levels is so outstanding that it has a primary role for the success of the game even if it’s quite simple. The "distant" acoustic tones, some doublebass gong-like strokes and even the sounds of some wooden ball rolling over some surface I’ve listened in the first track "Kirch’s comet" - referrinf to the so-called Newton’s comet, the first one discovered by telescope - activated such a memory, but the style reprises such an idea here and there all over the recording, whereas this French duet made up of the doublebass player David Chiesa and the guitarist Jean-Sebastien Mariage (who also plays guitar with Hubbub and Chamaeleo Vulgaris) pointed at the remote region of the Oort cloud, an hyphotesized spherical area considered by some astronomers as the cosmic area from where the comets start their route crossing so many times the area of Solar system as a source for the inspiration of their style based on acoustic improvisations. They look like following their route, able to kindle amazement and apprehension, with acoustic sparks and a way of performing fitting the matter : taps, raps and flaps on guitar or doublebass chords have been placed in intervals, which are wide enough to give the listener the possibility to hear the vibes and the dying frequencies they emit till the moment the wave oscillations gradually turning flat, what looks like a sonic transfiguration of a comet’s tide, while the instuments seem to echo their halo and the fascinating comas they draw in the sky. A record which is going to be appreciated even by those listeners who like contemplative stuff, even if they don’t really cope with improv music.